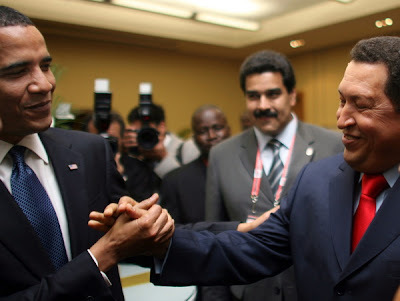 Right in a Left World: Chavez Meets "Ignoramus"
Smiles all around as Venezuela's Hugo Chavez shakes hands with the one just a couple weeks ago he labled as an "Ignoramus." Could it be that both share in their goals for our country? Dissing our long standing allies and embracing those who have expressed hate for America seems to be the order of the day. I love it. Cry now Lewnie. Hi Five to Hugo! Sanctions removed on Cuba. New American Century has come, but you Repubic clowns have been left behind. Abel "ME" Johnson (who is one person) praising FELLOW COMMUNISTS HE LOVES "HUGO COMMUNIST CHAVEZ" AND MESSIAH COMMUNIST NOBAMA. ABEL "ME" JOHNSON: WERE WAITING FOR YOUR OTHER POST FROM ABEL JOHNSON "ME". Don't keep us waiting Long. COMPUTERS EITHER ABEL “ME” JOHNSON. IT WON’T WORK. WE KNOW WHO YOU ARE. I wa ssurprised Hugo didn't give homey a copy of Noam Chomsky's book, then realized he probably already has one. As I said, mini-me, two peas in a pod sharing the same goal, hatred of the traditional America and desiring its destruction. Funny thing is, you and your compadres will be he ones most hurt if they succeed.